LONDON--(Marketwire - Nov 1, 2012) - Contemporary party fun and traditional holiday style create festive hotel offers in Central London that are ideal for Christmas gift-giving the entire family can enjoy. From Jazz Nights and city shopping to a traditional London Christmas or trendy party package, the exclusive London Marriott Hotel County Hall makes it easy to escape for stress-free holiday fun in the heart of this spectacular city. 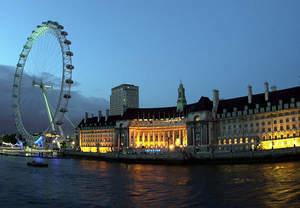 The London Eye hotel's one-of-a-kind accommodations put guests within easy reach of some of the city's most popular attractions, including the all-time holiday favorite -- Winter Wonderland, a "must do" London holiday extravaganza. Jazz Nights -- Set for Thursdays, December 6 and 13, 2012, Jazz Nights are a great way to kick-off a weekend with family and friends at Gillray's Steakhouse and Bar, a favored choice among London restaurants in Westminster. Priced at just £80* for an evening that includes a complimentary cocktail, three course menu and fantastic jazz entertainment, guests can party for the evening or upgrade to a residential package for a totally relaxing night of fun. Shop in the City -- Available Saturday, December 1 through Friday, December 28, 2012, this package includes River View accommodations, shopping vouchers, pre-shopping tea and crumpets, in-room breakfast the next day and free use of the hotel's Spa at County Hall relaxation areas for the ultimate shopping experience. With rates starting at just £348*, this package is a grand way to enjoy London's famed collection of shops and boutiques to complete Christmas shopping while enjoying pampering amenities at a remarkable London hotel and spa. Christmas in the City -- Relax with a two-night stay for a traditional Christmas holiday amidst 5-Star accommodations overlooking the River Thames and enjoy a pre-selected three-course dinner at Gillray's each evening and full English Breakfast to start each day. Christmas Day lunch is also included along with complimentary use of relaxation areas in the Spa at County Hall. Priced at just £318* this package is a perfect opportunity to visit historic Westminster Abbey for traditional Midnight Mass before partaking in a very special Christmas Day at County Hall. Party in London -- A simple package for those seeking the nightlife of one of the liveliest cities in the world, this package is priced from £276* and includes luxury accommodations and a full English Breakfast after partying the night away. Whether looking for a simple Christmas Afternoon Tea, special spa treatments, classic dining or private Christmas Dinner packages in one of the hotel's elegant private function rooms, the London Marriott Hotel County Hall is fully equipped to make the holidays merrier with elegant surroundings and stress-free options. *All prices are inclusive of VAT; overnight rates are per room per night. The London Marriott Hotel County Hall is a unique and opulent property located on the shores of the South Bank providing travelers with a historic destination amidst the beauty and grandeur of Central London and its many popular attractions. While surrounded with magnificent architectures, guests also revel in modern conveniences and gracious on-site amenities. As home to the Spa at County Hall, the hotel provides everything needed for a relaxing hotel stay whether traveling for business or pleasure. From Jazz Nights and city shopping to a traditional London Christmas or trendy party package, the exclusive London Marriott Hotel County Hall makes it easy to escape for stress-free holiday fun in the heart of this spectacular city.